The train shuffle brushes are my favorite for practicing Bluegrass banjo. Although the money for the full version was well spent, a “Tap Tempo” feature would make this app beyond perfect. I would lay down more coins for that. Charge you to download then give you a couple of samples and then they want mor money ! 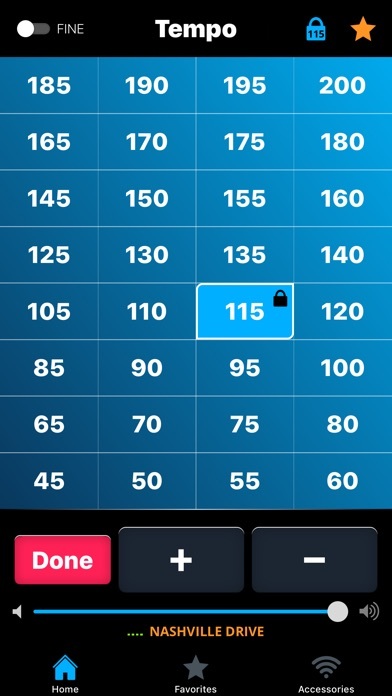 I love using this app as a metronome that doesn’t make me want to bang my head against a wall. Is it not enough that I bought this app for $5? Offering monthly subscriptions for *premium beats*? Check yourself Drum Beats Plus. You’re not Spotify. I like this app, but am only giving three stars because I have one big gripe with it. You pay $4 already for the app. But it limits you to tempo increments of 5 (95, 100, 105, etc.) unless you pay more money. Having increments of 1 should NOT be considered a pro feature for which you pay more. That should be a basic feature covered by $4. UPDATE: With the new update, they have remedied my complaint. 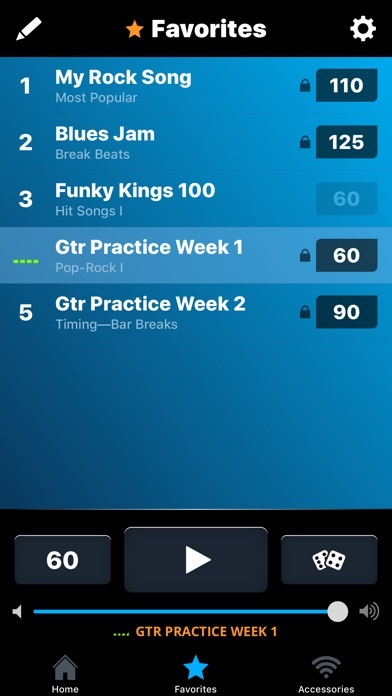 The base app now allows fine tempo increments of 1. Thank you! 5 stars now. I like this app, but am only giving three stars because I have one big gripe with it. You pay $4 already for the app. But it limits you to tempo increments of 5 (95, 100, 105, etc.) unless you pay more money. Having increments of 1 should NOT be considered a pro feature for which you pay more. That should be a basic feature covered by $4. This is one of my favorite apps that I use daily. There way a change in the app to offer some cool in app purchases and one of the free beats was accidentally switched to paid. I emailed the developer and they were quick to reply back telling me that it was a mistake. Great customer service!!! Highly recommend!!! Overpricing just killed a decent app. They just took a decent-sounding, simple to use drum backing app (that I already paid for) and made it unusable unless I now pay an additional $100.00 to unlock the new “VIP” features. That’s twice to cost of a full featured, top-of-the-line DAW app for a glorified metronome! How in the world are they justifying that price? Sorry guys, you just priced yourself out of business in my opinion. There are TONs of far superior drum apps out there for a fraction of the price. This WAS a cool app at less than $10.00, but there is no valid reason for it to be the most expensive music production app on the market. UPDATE - as the developer has kindly responded. I will push up to a 3 star. I might have been a little harsh. I still just do not like the idea of subscription models for apps or software. I understand the necessity in some cases, but I would be much happier to see in app content purchases. Especially in music apps. Then we could pay once for blocks of content. I purchase loops and patches and pro feature upgrades regularly in other apps. I probably don’t want to know how much I have spent on them, but I like that they are mine once purchased. I would likely pay for upgraded features and content in this app as well. But I only want to pay once to unlock each feature or set of loops. It’s fair for developers to be paid for their ongoing efforts, but IMO subscriptions are not the way to do it. Would love to be able to click record, And open my iphone mike. Easy Peasy. 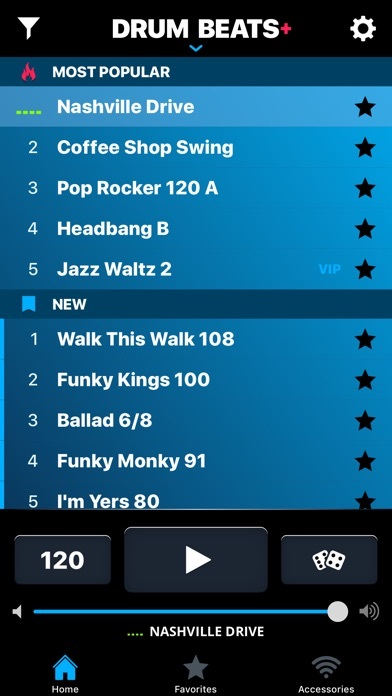 For a paid app, there are too many basic features missing for serious musicians without having to purchasing extra features: the ability to select a tempo in increments smaller than +/-5, and the inability to filter out unpurchased add-on grooves leads to absurd "VIP" content clutter in the UI. To their credit, the developer did respond quickly, acknowledging that these were annoying issues, but that eliminating them will require subscriptions. I will be looking into Drum Genius to use instead of this app. Alright, Im back with my beats! After having my library erased, ninebuzz promptly replied and now it solved my problem. Thank you! I've been teaching drums for over 40 years and have been playing for over 60 years. I have seen and used many creative ways of training drummers. Books, sheet music, hands on teaching and metronomes were all we had back in early years of my training. All of the modern technology, computers apps of this nature are wonderful tools, To help make the modern drummer the best that he can be. This app does what drum machines and metronomes always do, "Hold the drummer accountable for keeping the beat and staying in the pocket. One of the best drum machine apps out there. Serious? After I bought this app and kept it for 2yrs, u guys came with a major upgrade and u erase all my library and charge me 69.99 to unlock it? What to say about this company..?! As a bass player, this is exactly what I’m looking for in terms of practice and writing new bass lines. The variety of beats that comes with the purchase is pretty satisfying as well. If you want even more variety, there’s an option to purchase at a reasonable price. These are weak. The jazz is particularly bad, but nothing swings. You know how your favorite drummers have a million ghost notes and groove? There is zero of that here. 100% synth drums programmed without understanding of feel or dynamics or anything slightly musical. A waste. Should have gotten an expensive coffee with that $. This app is very simple to use! I use it to accompany my ukulele. It allows you to keep rhythms you use as favorites. Doesn't over power you. When my battery was unexpectedly low, checking the Battery usage report in the settings showed Beats+ utilizing 90% with "background activity". I’ve purchased all of the packs and love all of them. I love to challenge myself with new beats and it helps me to write songs in whole new ways. I recommend it to all my writing partners! American Cruise lines nightly ! I don’t know what happened, but on my old ipad i have an older version and it works just fine with Audiobus, with the newest version, not at all ( hence the 4 star rating). I payed for the lifetime subscription because it really is a great app. With Audiobus, this app would be perfect! Exactly what I needed for practice. Best one on the App Store. They do really need to add more though. Tired of the same ones. I hate the sound of a metronome. This app makes practicing feel more fun! Amazing app! Lotsa great features and tons of variations. Highly recommended! I play bass guitar, and I essentially feel that you need drums to fully develop more as a player, I've been messing with this for a couple of days now, but I feel like I'm listening so much more differently and getting more in depth musically by understanding on how a drummer thinks and plays. I think it's great for any instrumentalist even drummers it's a good tool for inspiration. I really like the beats, but it's just that it's hard for me to play my guitar with the beats rhythmically because either the beats were too fast and too slow. I want to know if we can change the tempo by 1 instead of 5. I'm loving the app. I'm a 52yr old guy, getting back into playing again, after other life commitments. Really like that I can slow the tempo down to learn a groove. Better than slowing down a turntable. Between this a garage band , I'm have a blast learning and playing. Funky drummer is a beast to groove!!! Easy to use and plenty of variety to inspire good practice routines. The different grooves cover popular styles and the ability to adjust tempo instantly is boss. This app is by all rights the best app I've found. I lead mucus in a small church, guitar and a piano, and I'm planning on adding this as a drummer option to go along with my other mechanical drummers. There are some beats that will absolutely fill in the gaps!! Works with garage band if you like to record a track. Very easy to use. Practice with a beat and improve much faster. The only problem with this app is, it's so good and useful that you wish it had more features! I use it every day as a teacher. Great quality, great sound. You will want the whole package so buy the whole thing. I'm really hoping they keep expanding this thing and adding more features. It's that good. I had put my bass down for a couple years and needed to work on my timing again. Found this gem and worth every penny. Many different styles loaded let's you mix it up and learn new ways to play. Great app! Limited GREATLY by only having 5bpm increments and also doesn't go slower than 60bpm. Fix those issues and you'd get 5stars easily. When this application is open, the speakers are constantly humming. Even when it is open on the background. The hum is incredibly quiet, but you can hear it when you put the speaker of the phone to your ear. My battery life has been decreasing for the past couple months and I had no idea why. I'm incredibly disappointed by this! The best beat app for bass players! 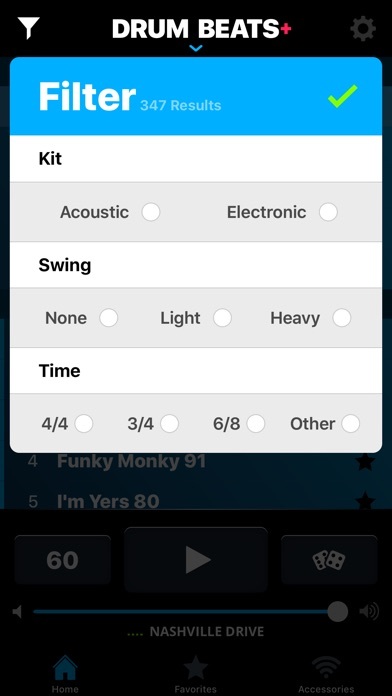 This app has helped me as a bass player. Amazing detail with clean crisp sound! A must-have! Quality sounds, works great with bluetooth speakers. Love using with scale practice, chord progressions and as timing trainer. Also great for inspiration and getting the feel for rhythm. Don't normally suggest apps, but you got to get this one!! Good tool for jamming or polishing your chops! Best $ I've spent on a guitar app! Such a simple app but so much fun! I love it. Love the rhythm and timing section! This is a great application but what I find missing are standard ballroom rhythms. There is no Tango, Foxtrot or Cha Cha beat and the only Rumba beat is too busy. While it may be possible to adapt the preset beats to fit ballroom style It would be nice if the names of those presets that are adapted and saved in the favorites folder could be renamed in order to customize. Best I have seen. So many options. Keep up the great work. Is there a way you could add a feature to be able to just press a button and get a fill and go to a secondary beat like in a chorus? This app run on background, always, everytime before manually killing it. So Device’s Bettery is drained too fast. Developer should fix this problem. The app is ok as a practice tool but I had to remove it because it was a 70% battery drain because of audio activity while not in use. Listening to me? Don't like it, don't trust it. The app is great for something to play along with. I’d like to ask if you could add a 5/4 and 7/4 time signature. Not very common, but there are musicians out there that do like to play with these time signatures. This thing is excellent for practicing bass lines and brings out the creativity in the musician. Every drum pattern has a snare in it, not one Latin or ethnic beat to be found. But there is a latin jazz app in the more/app. Just what i was looking for and it was FREE!!!! Gave me goosebumps lol. This app makes practice time very enjoyable! With a wide selection of beats and grooves, which can be played at at slow to fast tempos, and quality sounds- feels like playing with a drummer. I bought this app and it will not load at all. Sad! Thanks to the nine buzz team for allowing fine tempo adjustment. Now please add ‘adjust tempo while playing’ without resetting to beat 1. Very offputting Because can’t adjust tempo while playing without the song falling apart! Sort of needed... Thx. Way more fun than a metronome. It makes the process of mastering difficult passages so much more engaging. Start slow, build speed and accuracy. In addition to any other uses, this is a must have practice tool. I wanted a metronome to practice with that was better than a standard click. But after buying this app, it quickly became clear that 60% of the drum tracks are locked behind a paywall subscription model or would cost a one time additional fee of substantially more than what the app is listed for on the store. I will look elsewhere. Everything that the five-star reviews say. Our band sometimes has to practice without the drummer, and I've always been able to find the right beat to go with a song just from the free ones, even if it sometimes took up precious group time auditioning through a few. Now I have most of my go-to beats written down in my sheet music or at least Favorited in the app. For writing, it is fun and easy to dial up a beat that is infinitely more inspiring than a metronome and won't bog down your workflow. Has all the beats I need or want when I sit down to play for 10 minutes or 3 hours. Ive been using it for a few years now and never had a problem. Love it. 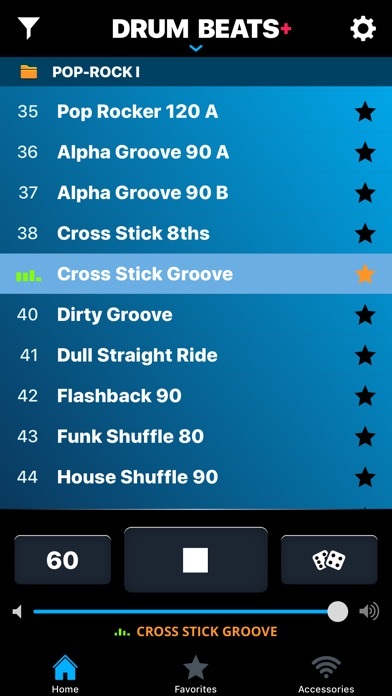 If this app allowed me to adjust the BPM by increments of one then I would have given it 5 stars. Only a handful of songs I play have the BPM in increments of 5, so I cannot use this app for the majority of songs and it does not make sense for me to switch to this app just for those songs. So this app unfortunately is useless to me. The concept is great and if there is a way to change the BPM by 1 then please let me know and I will change the rating.